Helpful hints, tricks and standardized ways of doing things to make using Altium Designer easier. Digital logic is the study and application of the fundamentals in digital (binary) electronics, e.g. gates, flip-flops, state machines. Karnaugh maps are a way of simplifying combinational logic, often used before realising a combination equation into a number of gates to reduce the complexity. CEDAR Logic Simulator is my personal favourite. Free, easy to use, colours the wires depending on their state, and allows for named nets as well as direct connections. The 6-state binary counter is a counter which counts from 000 to 101 in the normal binary fashion before resetting back to 0. The output increments on every rising-edge of the count pulse, and the direction pin (upNDown) determines the count direction (when upNDown = 1, the counter goes from 000 to 101, when upNDown is 0 the counter goes from 101 to 000). Schematic of a six state binary counter. 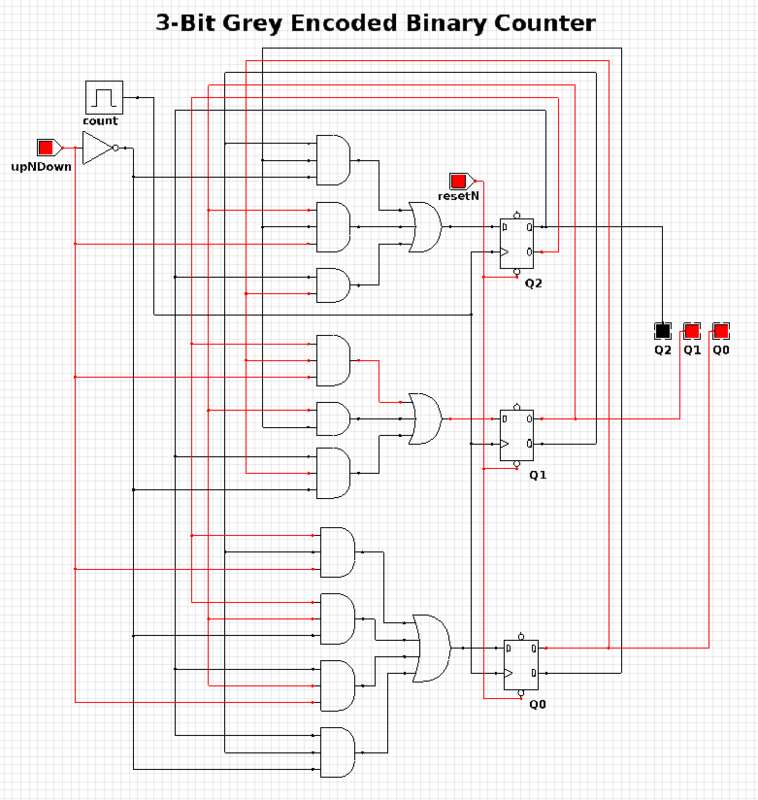 The 3-Bit Grey Encoded Counter is a counter that counts from 0 to 7 in binary in a grey encoded fashion. The counter increments on every rising edge of the bit ‘count’ and the direction bit ‘upNDown’ determines the direction of counting. Schematic of a three-bit Grey encoded binary counter. This quadrature detection circuit is built entirely in hardware, and only uses one flip-flop. It is useful for detecting the direction that an encoder that outputs quadrature signals is spinning in. Potential applications include BLDC motor control. 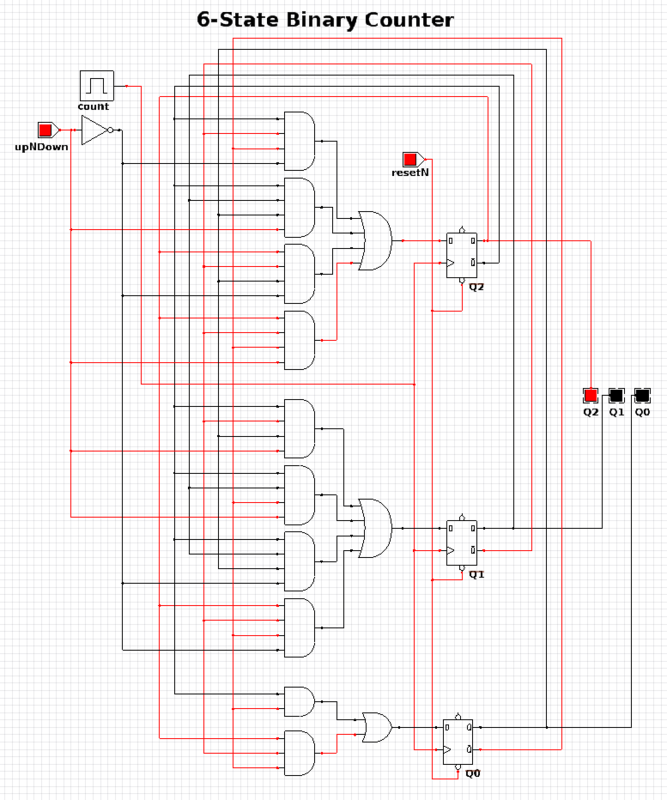 This circuit can be built entirely in reconfigurable PSoC on-chip logic. When the encoder is spinning in one direction, the output will be logic high (1), when it is spinning in the opposite direction, it will be logic low (0). A simple quadrature phase detection circuit using a D flip-flop. A simple delay circuit can be made just by chaining DQ flip-flops together in series (the output of one feeds the input of another). For every flip-flop, the signal will be delayed by one clock-cycle (assuming they all share the same clock source). A simple four clock-cycle delay element made from four DQ flip-flops. This can be used as a simple timer. This can be used to make a simple timer. Obviously, a limitation is that a flip-flop is needed for every clock cycle of delay needed (try that with a 1000 clock cycle delay!). More advanced timers use binary encoding with the flip-flops to achieve a greater number of states for a lower number of flip-flops.